This post I first published 2 months ago on July 24, 2018 is even more relevant because since I wrote this post the Oakland A's in the AL West have played great baseball, having the best record in MLB these last couple of months. That means there are four super teams in the American League led by the Boston Red Sox, Houston Astros, New York Yankees and now the Oakland A's. If Houston wins the West, by virtue of finishing behind the Boston Red Sox, the Astros will not have to face the Wild Card winner [between the Yankees and the A's] but the Red Sox will [because they will have the best record in the AL]. That means if the Astros can beat the Indians in the ALDS, they will only have to face one of the other 3 best teams in the AL, while the Red Sox will have to face two of those other best teams back to back. 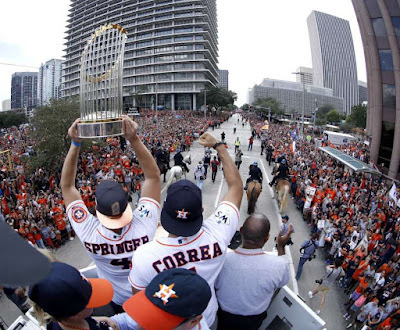 Full disclosure: I am a 100% full-throated Houston Astros fan who is proud of the Astros winning the World Series Championship in 2017 and who wants them to repeat in 2018. Also, I would love for the Houston Astros to have the best record in, not just the American League, but in all of baseball to have home field advantage throughout the playoffs. While I would love for the Astros to have the best record in the American League going into the playoffs, a case can be made why it would be advantageous to have the second best record in the AL [and baseball]. There are many great teams in the American League and I don't want to slight any team, but it seems like, so far, the three best teams are the Boston Red Sox, the Houston Astros and the New York Yankees. It would be very demanding for one of those teams to beat the other two, back to back, to make the World Series. The Wild Card winner would almost certainly have to do that. And who else would probably have to do that? That would be the team with the best record in the American League. Check out this official playoff format for MLB: [since MLB went to a second Wild Card team in 2012] "under the expanded wild card format the winner of the one-game wild card playoff faces the top-seeded divisional champion in the Division Series, regardless of whether the two teams are in the same division, while the second- and third-seeded divisional champions play each other in the other Division Series." So, for example, if the Boston Red Sox had the best record in the American League, then that would mean automatically that the New York Yankees would be a Wild Card team playing a one game playoff. If the Yankees were to win the Wild Card game, the Red Sox would have to face them in a tense 5 game series and not the Astros having to face them [and that would be true even if the Yankees also had a better record than the Astros]. That would mean the Houston Astros, by not having the best record in the AL could avoid playing the Yankees and the Red Sox back to back and at most they would only have to face one of them in the ALCS, and if somehow the Wild Card winner [let's say the Yankees] were to upset the Red Sox in a best of five series, then the Astros [provided they ended up with the second best record] would still have home field advantage in that Championship best of 7 series. If the Red Sox were to beat their rival Yankees, they would then immediately have to play the Astros with, yes home field advantage, but in a 7 game series. That certainly would be a big mountain for the Astros to overcome, but possibly not as hard as if they had to face the Yankees and then the Red Sox back to back [even though they would have home field advantage].